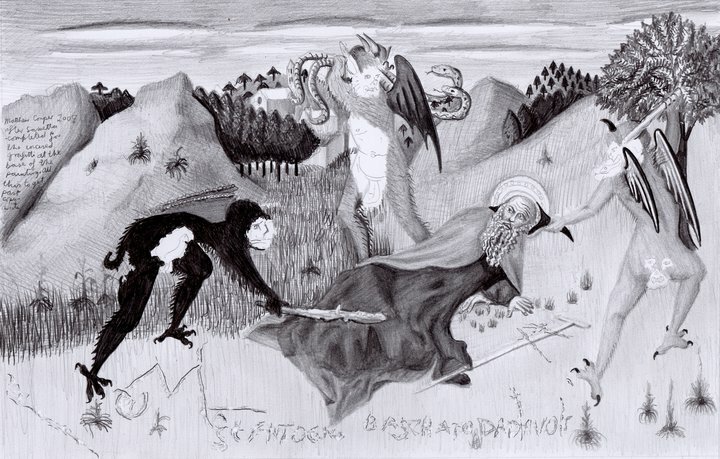 a copy of Sassetta's 'St Anthony the Hermit being tormented by Devils', the original painting being in the Pinacoteca Nazionale in Siena, Italy. I made this copy to emphasise the graffiti on the base of the original, which I adapted into in a large painting from 2006 called 'The Birth of Death (Under Black Light)', but also to try to dodge copyright, which to then,after finishing the drawing, realised that the then 583 year old painting would probably be out of copyright. 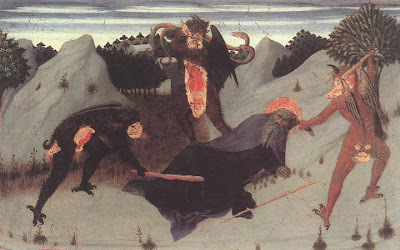 Sassetta's 'St Anthony the Hermit being tormented by Devils', 1423, Panel, 24 x 39 cm, Pinacoteca Nazionale in Siena, Italy. 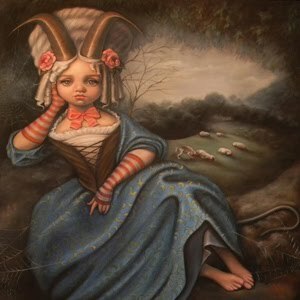 I got this image off the internet, specifically from one of those websites that advertise "quality oil reproductions" of an artwork. They've actually cleaned up this image by removing the incised graffiti that appears along the base of the image.